Two men are primarily responsible for inventing American cemetery law: Samuel B. Ruggles and Joseph Story. Joseph Story was the first president of Mount Auburn Cemetery and is buried on Narcissus path. 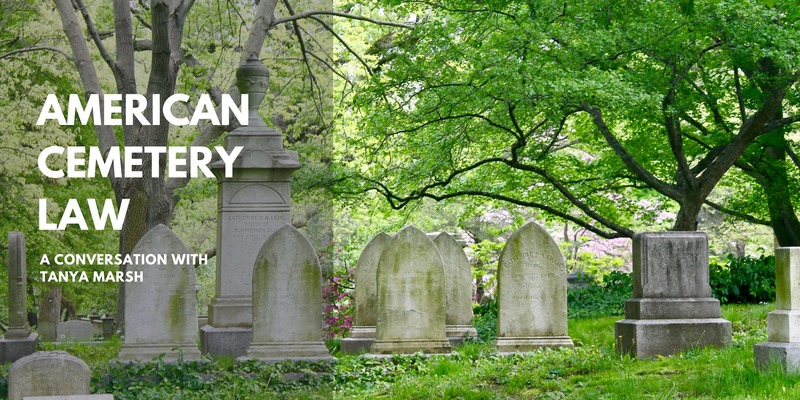 Join author and law professor, Tanya Marsh for this talk in Story Chapel and learn about how American cemetery law is unique and the role that Joseph Story and Mount Auburn played in its development. Tanya Marsh is a Professor at Wake Forest University School of Law in Winston-Salem, North Carolina, where she teaches courses in Property, Estates and Trusts, and the only course in Funeral and Cemetery Law in a U.S. law school. Marsh is the author of The Law of Human Remains (2015), the first treatise on the subject in more than 70 years, and the co-author of Cemetery Law: The Common Law of Burying Grounds in the United States (2015), as well as several other books on the subject. Marsh writes and speaks frequently on topics related to the law regarding the status, treatment, and disposition of human remains and cemeteries. She is a graduate of Indiana University and Harvard Law School.